We’ve all seen and heard a news story about someone who has been fired for saying or doing ridiculously stupid things on Facebook, like calling out sick and then posting photos of their drunken night out, announcing that they were skipping work or even bashing their boss and the company they are employed by.How stupid! Yes, we’re all thinking it. In an effort to save you from your future unemployment, here are a few things you should bypass doing on Facebook. Having your Facebook posts set to ‘public’ is a huge blunder, because people; like your bosses, the IT guy or the cranky girl in the next cubicle, can see all the posts you’re making. Sad but true, you can still get fired from posting things if your profile is private, but at least it reduces the odds. You may not be “friends” with your bosses on Facebook but it only takes one disgruntled co-worker, that you are friends with, to turn you in. Do not say anything about your co-workers, boss or workplace on Facebook. Unless it’s so obviously positive that there is no chance it could be misconstrued as negative or offensive. Doing this may get you fired for harassment, bullying or just being a rumormonger. Avoid trying to be comical on Facebook, when it relates to your work, your customers and your colleagues. 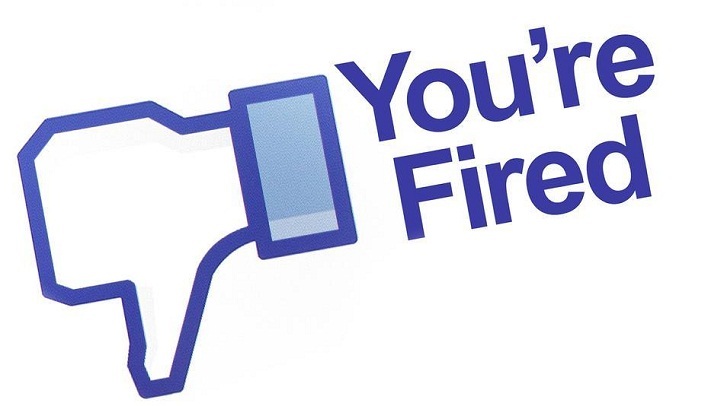 Many people have been fired for sidesplitting stories about customers on Facebook. And good chance they won’t be a customer for long if they find out. Being a racist, homophobic or any other type of prejudice can be detrimental to your career. Even if you actually are, which is sad in itself, don’t broadcast it. It’s a fabulous way for you to lose your job and your company to lose business. Be cautious of clicking the like button on Facebook Pages that conflict with your company’s values or beliefs. In 2012 six Virginia workers were fired just for liking the Facebook Page of their boss’s political opponent. A federal judge ruled that clicking the ‘like’ button is not constitutionally protected speech. Think before you “check-in” during working hours, especially when you’ve called out sick. If you’re meant to be in the office, it’s probably not the niftiest idea to check in at the amusement park or the tavern down the street. Social media institutes the need for us to announce to the world what we are doing every minute of our waking day. You should probably stop to think that there are people, like your boss, who wouldn’t be thrilled about that particular tidbit of information. Firings, thanks to social media, are on the rise. It’s going on all around us and it’s probable that it will continue to increase as we spend more and more time on social networks telling everyone about everything we’re doing. It’s not only getting people fired, but it’s also making it more difficult for them to get new jobs. I’m sure we’re all guilty of a few of these things, but please, try to fully engage your brain before you post online. Once it’s out there, it never goes away!